(CNN) -- When Margaret Atwood looks into the future, she sees catastrophe. In "The Handmaid's Tale" (1985), religious fundamentalists rule the United States and women are treated as chattel. In "Oryx and Crake" (2003), genetic engineering has run wild and commercialism dominates society. And in her latest novel, "The Year of the Flood" -- a companion to "Oryx" -- civilization buckles under humanity's carelessness, wiping out much of the species. Still, Atwood considers herself an optimist. "Anybody who writes a book is an optimist," the much-honored writer says, with a dry impishness, in a phone interview. "First of all, they think they're going to finish it. Second, they think somebody's going to publish it. Third, they think somebody's going to read it. Fourth, they think somebody's going to like it. How optimistic is that?" In other media: "The Handmaid's Tale" has been made into both a movie and an opera. For "The Year of the Flood," Atwood wrote several hymns attributed to God's Gardeners; these have been set to music by composer Orville Stoeber and are available on CD. Scheduled appearances: Feb. 22, Tallahassee, Fla. (Florida St. Univ. ); Feb. 23, Atlanta, Ga. (SCAD-Atlanta); Feb. 25, Davidson, N.C. (Davidson Coll.). ; March 2, Flushing, New York; March 3, Buffalo, New York. But what about the environmental disasters, corporate detachment, religious extremism and general human soullessness she portrays? We already live with it, she observes -- just not in the quantity found in works such as "The Year of the Flood." "That's what that kind of book is for -- it's for looking at things and pushing them a little bit further along the path, to see what it would be like if we went there," she says. In "The Year of the Flood," set in the not-too-distant future, things have gotten pretty well along the path. Corporations and governments are intertwined, and the well-off live in protected corporate communities. Much of the population, however, lives in slums and scrounges for food -- some eating the creations of fast-food joints such as SecretBurgers, where the secret was "that no one knew what sort of animal protein was actually in them," Atwood writes ("Soylent Green," anybody?). Latchkey kids roam the streets, stealing and making trouble. The unlucky dead are discarded like so much biological waste, perhaps to be made into something commercially useful. Animal DNA has been crossed and tinkered with to create beasts such as rakunks and wolvogs. And a handful of characters, notably the hard-bitten Toby and the wide-eyed Ren, make their way through the world, helped by the faithful of a religious group called God's Gardeners -- and their own wits. "Flood" is, in some ways, a continuation of "Oryx and Crake," which introduced much of its world. (The characters Oryx and Crake, the latter a genetic engineer, have small but pivotal roles.) Atwood says she decided to continue the story because "so many people said, 'What happens?' ... I didn't know the answer, and therefore had to think about that." A number of the issues raised in "Oryx and Crake," she continues, piqued her interest, particularly since they parallel what's going on in real life. "One of those is the way that nature, science and religion are coming together," she says, noting the popularity of the film "Avatar." "The interesting thing to me is [the] various trends, and my religion in the book is kind of what it would be if people just got a little bit more organized, though they might not go for those [shapeless] outfits." 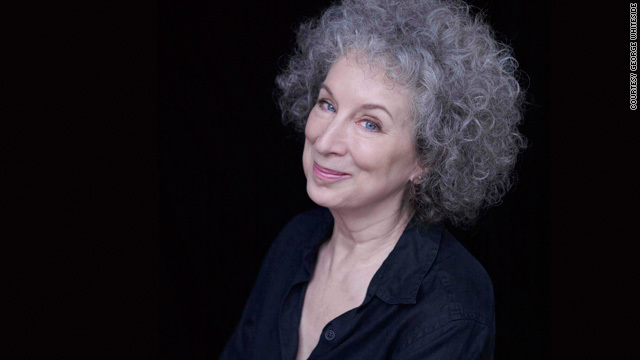 Though Atwood deals with some weighty issues, "Flood" -- like her other works -- has some wickedly humorous touches, particularly in the product names and slang of the future society. The corporate security force is called the CorpSeCorps; the firms have names such as HelthWyzer and Seksmart. People wear the tresses of Mo'Hairs, an animal bred for its pelt, and drink at Happicuppa, a Starbucks gone mad. It's a cleverness borne of necessity, says Atwood. "I have a need for a word, then I have to find the word," she says. And it's not always easy: "What you have to do if you're putting a product or a corporation into a book, is you have to search and find out if there is one or not already. And if there is one already, you have to change yours so it's not the same." In "Oryx and Crake," she says, she had created an assisted-suicide channel called NightyNight. Unfortunately, in real life, that name belonged to a children's sleepwear company. "You don't want a situation in which you name an assisted-suicide television program after a children's sleepwear company," she says. Though Atwood, a strong supporter of environmental and social causes -- she recently wrote a nonfiction book about the impact of debt -- is skeptical of technology, she's by no means a Luddite. "The Year of the Flood" is connected to an extensive Web site, which includes links to an Atwood blog and -- yes -- even a Twitter feed. She also has her own Web page, http://www.margaretatwood.ca/. She's also been touring in support of the book and giving lectures on favorite subjects. But she can't help but be drawn to cautionary tales. Asked about works that she read growing up, she reels off George Orwell's "Nineteen Eighty-Four," Arthur Koestler's "Darkness at Noon" and Curt Siodmak's horror novel "Donovan's Brain" which was made into a '50s B movie, and also inspired Steve Martin's comedy "The Man With Two Brains." It's all part of the message that our current society could be as ephemeral as the life of a mayfly. Why, even the Internet -- this incredible repository of creativity and knowledge -- could be damaged by the impact of a giant solar storm. Better to keep information close at hand, says Atwood -- preferably on paper. "Anything on the Web is very vulnerable," she says. "Anything you really want to keep, you should probably have in a hard copy."